For first-time users, buying an e-cigarette can get confusing. Aside from what its benefits are, the various parts, batteries, e-juice strengths, and flavors, perhaps the most difficult decision new users have to make is the choice between atomizers, cartomizers, and clearomizers. All three perform the same basic task, which is to atomize e-liquid to create vapor. But if the basic premise is the same, why do you need to choose one in the first place? It all boils down to preference; specifically, how you intend to use your e-cigarette. Before going further, it’s important to note that all e-cigarettes need an atomizer to work. Cartomizers and clearomizers all have atomizers to vaporize e-juice. The main difference among the three is the delivery system. All atomizers, including cartomizers and clearomizers, have at least two posts inside: the positive and negative. Connected to the two posts is a coil wrapped around a wick, usually made of a heat-resistant material such as silica. The wick, acting as the membrane, is there to provide a steady flow of e-juice without flooding the coil. You will know if your atomizer is flooded when your vapor production weakens and you start to hear gurgling noises. If this happens, you will need to flush it out by blowing through the opposite end of the atomizer, or shaking it dry. At their most basic level, atomizers work by holding e-juice then vaporizing it to produce vapor. There are various types of atomizers in the industry today. For the most part, the cartomizer which is a cartridge with a built-in atomizer, is the way most people choose to go. Even so, within these cartomizers are top-coil, bottom-coil, dual-coil, horizontal and vertical coil atomizers to name a few. To put it simply, the atomizer, whether built into a cartomizer or in a stand-alone design, uses a heating element (usually a very small gauge wire) to vaporize the e-liquid. If you are more of a technically minded person then let’s try this explanation. Looking at the atomizer you have a wire which is connected to a circuit board as well as a power supply. The circuit board (when activated by a push of a button) sends power to two places. The first is a heating element (the thin wire) and the second is a micro-pump located within the atomizer. The pump forces the e-liquid through the atomizer where the heating element is located. As the e-liquid passes this it is vaporized. This process continues until the user stops sucking or the button is released. Different models function slightly different. Where Are Atomizers Found? What are their uses? Typically the atomizer is part of both the two-piece and the three-piece electronic cigarette. On the two-piece e-cigs however it is rare that you would ever need to bother yourself with it. It is the three-piece e-cig where the atomizer is something you need to pay attention to. The three-piece e-cig uses the atomizer as a stand-alone piece to the entire puzzle. Either way, you cannot have an electronic cigarette without an atomizer. A method of vaping that has caught on over the last year especially is dripping. Dripping is a pretty self-explanatory method of vaping where you simply drip the e-liquid into the atomizer directly. This bypasses the cartridge or the tank completely. Of course there are some obvious drawbacks to vaping in this manner. First however, lets take a look at what benefits can be taken away from dripping. The first and most powerful argument for dripping is the taste and flavor of the e-juice. Provided the atomizer is clean, the flavor of the e-juice is more evident when dripping. The e-liquid is not forced to sit for long periods in a tank or cartridge nor is old juice mixed with new juice. The e-liquid that is dripped into the atomizer is burned up during that session so nothing remains. Many people who are self-proclaimed purists swear by dripping as the best way to vape. The most obvious drawback to dripping is the inconvenience of it all. With this method you cannot just simply pull your e-cig from your pocket and start vaping. To drip you must almost always be somewhere that you have the time to set up the things you need and then you can proceed to vape. It takes quite a while sometimes if you are not prepared before hand. It can also be very messy. If you are not careful it is easy to drip e-juice everywhere. It is also recommended that you wear gloves because nicotine can soak through your skin and you can expose yourself to toxic amounts of the chemical by doing so. Today dripping has become rather popular despite its obvious drawbacks. There are those who are very serious about their flavors and the quality of the e-liquid they use. For these people, dripping is absolutely the only way to vape. Typically you will also find that those who prefer this method will also mix their own flavors of e-juice and will usually rebuild their atomizers as opposed to purchasing new ones. The market has noticed this as well and there are even a few models out there specifically made for dripping. Among the three, atomizers are the shortest. An atomizer is filled by dripping e-juice directly onto the coil. This is called direct dripping. For disposable 510 or 305 atomizers, 3-4 drops will suffice, which is good for about 10 drags. Other atomizers, especially the rebuildable models, allow users to drip from 10 to 15 drops without over-flooding. While the number of drags one is able to take with atomizers is significantly less than what cartomizers and clearomizers provide, direct dripping is preferred by many for its clean and flavorful vape. However, because of constant dripping, atomizer users will have to carry a bottle of e-juice around with them at all times. You will know when to refill an atomizer once the flavor wanes. When you notice your vape getting less flavorful, drip on it right away, so you don’t dry burn the wick and get a burnt taste on your next drag. When a wick has been dry burnt, all it takes is a couple of drops, and you can vape normally again. If you are familiar with the three-piece system then cartomizers should be easy enough to grasp. If you are not, you soon will be. In a typical two-piece system you will have the battery and the cartomizer. It is the cartomizer or cart that we are concerned with however. There are a few different varieties of carts on the market today and each has their strengths and weaknesses. Let’s take a look at these and how they work. Longer in size than atomizers, but just as wide, cartomizers are often described as “extended atomizers.” However, instead of silica wicks, cartomizers use fillers or Poly-fil – a cotton-like fiber used to hold the e-juice. While single coil cartomizers are available, most are dual coil. This means two coils are used to give a lower resistance and provide more vapor. However, dual coils are notorious for eating through batteries. Able to hold a greater amount of e-juice, about 10 drops or so, cartomizer users can go on extended vaping sessions without refilling. Like atomizers, cartomizers are refilled or “topped up” once the flavor starts to wane, but refilling can be a pain since it requires tipping the cartomizer at an angle to avoid filling the air hole, or doing so via syringe. Unlike atomizers, though, once you dry burn a cartomizer, the Poly-fil is ruined and needs to be discarded. However, instead of wasting a perfectly good cartomizer, one can convert it into a dripping atomizer by removing the filler carefully, using tweezers. Once the filler is completely removed, you can reuse your cartomizer just like any normal atomizer. But be aware that since you’re dripping directly onto the coil without a wick, expect to burn through e-juice quicker. Experienced users often keep converted cartomizers as backups to be used only in emergencies. These days, cartomizers are not as popular and widely used as they once were. With e-cigarette technology evolving rapidly, atomizers can now hold as much juice, or more, than the cartomizers of old – without the awkward refilling, the risk of filling the air hole, and the risk of burning through the Poly-fil. The upside of cartomizers is that they usually come pre-filled with e-juice. This is great for those who need an atomizer and e-juice in a pinch, and don’t want to bother themselves with constant refilling. Also referred to as tanks, clearomizers come in various shapes, sizes, and configurations. 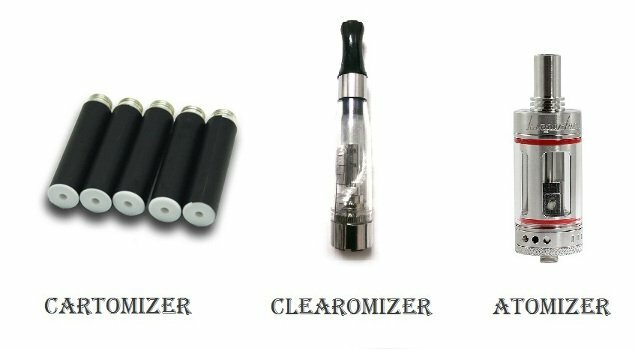 But regardless of the type, clearomizers can hold more e-juice than both atomizers and cartomizers. With e-juice capacities ranging from 2.5ml to 5ml, clearomizers are great for users who don’t want to carry a bottle of e-juice around all the time, for those who are driving and for those who just want the convenience of vaping without refilling constantly throughout the day. Using clear tanks to hold the e-juice, users can monitor their juice consumption by simply checking the remaining level, thus reducing the risk of dry hits and burnt tastes. However, there is still a chance you can get dry hits. If so, depending on the coil configuration, you either tilt the tank to saturate the wick for top coils, or loosen the wick then do a dry pull – which is taking a drag without turning the e-cigarette on – for bottom coils. Once a clearomizer’s coil has been worn down, or if the wick becomes too gunked-up with dried e-juice, instead of discarding the whole tank, users can either rebuild a new coil and wick (for advanced users), or purchase pre-built coil heads (great for beginners). The level of customization available to clearomizer users is high – from the choice of resistance (whether pre-built or rebuilt), the amount and type of wick to regulate e-juice flow, the size of tank (to determine the amount of e-juice it can hold), and even how it looks by swapping out the tank with other tanks of various colors and designs. When choosing clearomizers, the two most important things to consider are tank capacity and type of coil. While tank capacity is pretty straightforward – the smaller the tank, the more portable yet lower capacity, and vice-versa – the type of coil requires more deliberation. The type of coils used in a clearomizer plays an important part in determining your vaping experience. Each has its own pros and cons, and below, we will examine each to help you decide which type works best for you. A clearomizer with a top coil places the atomizer closer to the mouthpiece to give users a warm vape similar to that of smoking a cigarette. Top coils are also easier to refill, since one needs only to remove the top cap. These make top coil clearomizers great for beginners. However, given the placement of the wick and coil, dry hits are much more common. To avoid the risk of dry hits, users find that by tilting the tank towards the mouthpiece while vaping works well. If you are comfortable with the idea of vaping at an angle, or at least tilting the e-cig often, then top coils are a good choice. A tank with bottom coils eliminates the need to constantly rewick by tilting, though it provides a much cooler vape than top coils. A bottom coil also provides more intense flavor, since the coil and wick are placed closer to the airhole. One drawback is that bottom coils are much more prone to flooding, especially when the wick material is not enough or too porous. However, if the wick material is too dense, this can lead to dry hits. A perfect balance is needed to ensure a perfect vape with bottom coils. Refilling a bottom coil is also trickier, with users having to remove the whole tank just to refill. Interestingly, most popular tanks these days – such as the Kayfun, Lemo, Kanger Subtank, and Aspire Atlantis – are all bottom coils. While dual coils are common, it’s not unusual to hear users with triple or quadruple coils built into their tanks. One thing to remember about multiple coils is that they produce massive clouds of vapor and give users a much stronger throat hit. Surprisingly, even with multiple coils, these types give a cooler vape since the heat isn’t concentrated on just one coil. However, multiple coils also draw more power from batteries. If you are prepared to switch batteries often, or use larger e-cigs with higher mAh, multiple coils can be a viable choice. Of the three types, it really comes down to personal preference. If you like a warm vape, then top coils are best. If you like a more flavorful vape, bottom coils are the way to go. If you prefer throat hit and solid vapor production, then multiple coils are perfect. Whichever type you choose, be aware of their disadvantages so you won’t get surprised in the end. So, Atomizers, Cartomizers, or Clearomizers? Each have their own pros and cons, having to sacrifice one quality in exchange for another. But If you can choose just one, clearomizers or atomizers are recommended since cartomizers are outdated and are much harder to procure these days. However, that’s not to say cartomizers don’t have their place in any vaper’s arsenal. If you are the type who prefers fuss-free vaping – without having to worry about constant refilling – pre-filled cartomizers are cheap enough to dispose of after every use. Atomizers are usually reserved for advanced users, since the amount of tinkering involved and high maintenance required makes them great for only the most dedicated vapers. However, for many users, the flavor intensity that atomizers bring to the table makes it all worthwhile. For beginners, having a spare atomizer (even if just the disposable type) on hand can be useful, especially if you need to taste different flavors in one sitting. Clearomizers, on the other hand, are the hands down favorite among most users, both beginner and advanced, simply because of the convenience and the high level of customization available. New users can enjoy swapping out coil heads to experiment with varying resistances, while advanced users can experiment with rebuilding various coil configurations to achieve maximum flavor and vapor production. In the end, the choice is always yours. If you can afford it, you can get one of each and swap them out depending on the situation. But no matter what you choose, anything that gets you off cigarettes is a good choice. Could I use a clearomizers for essential oils? I really want to use clary sage oil in a vape pen for my pcos would it work? I am having same problem. I thought I needed another coil. I put a new one in both of my ecig both are telling me the same thing. Illustrations would be most helpful.